Human Growth Hormone, or somatotropin, is produced by the body's pituitary gland, and it is the main hormone driving growth and development in children and adolescents. As can be expected, levels of this hormone decrease in the body with age, however the body does not completely stop producing HGH when we reach adulthood. This is because HGH plays a role in ongoing functions of the body, like the growth and repair of muscle and bone, and it may promote the breakdown of fat. HGH is used in the legitimate medical treatment of a number of diseases, including childhood growth disorders and certain types of muscle wasting disease. In the past, these disorders were very difficult and expensive to treat, as the only way of getting human growth hormone was to extract it from human cadavers. Thankfully, scientists discovered how to produce HGH synthetically, and synthetic HGH has been cheap and abundant since the mid 1980s. While HGH is available under prescription from medical professionals in Australia, it is only indicated for the treatment of hormonal deficiencies. Use of HGH without a prescription in Australia is illegal, and there is a black market for this hormone. A safe, effective and legal alternative to injecting this hormone exists. There are supplements on the market, primarily based on amino acids, that can stimulate the body to naturally produce and release higher levels of its own HGH. A higher level of circulating HGH has been shown to enhance the rate of muscle synthesis, strengthen the bones, assist in fat loss, and enhance heart and kidney function. HGH makes training more effective, lifts mood, enhances sleep, and many people believe high levels of HGH can stave off the aging process, although this is not backed by evidence. It is particularly effective in people older than 30 or so, for whom natural levels of HGH have started to decline (1). HGH can be increased artificially, through hormone injections, which are expensive, dangerous and illegal, or through supplementation with natural products that science has shown to be effective in safely raising the body's own production of this vital, anabolic hormone. HGH injection is asssociated with a number of side effects. The most common of these include increased drowsiness, nerve disturbances including pins and needles and abnormal or reduced sensations of touch, carpal tunnel syndrome, joint pain, hypoglycaemia, headache, dizziness and water retention. When HGH is prescribed by a doctor, a medical professional has made that decision using their years of training to weigh up the risks against the benefits. They also have access to a safe product and the ability to calculate a correct dosage. HGH purchased online, or from a non-medical practitioner has a number of additional risks. Using too little HGH is a waste of money, while people who use too much run the risk of severe, irreversable and life threatening side effects. The best known of these is acromegaly, which is caused by a thickening of the connective tissue and bones. This causes very noticeable deformities. It particularly effects the jaw and facial cartilage, radically changing the appearance, and fingers and toes, where it can restrict mobility. Due to the remodelling of the bones and connective tissue, this condition can also be very painful (2). HGH increases the rate of growth of cells and structures in the body, and it is believed that high levels can increase the growth rate of cancer cells. This is obviously something that is very difficult to study, but this frightening side effect is worth keeping in mind (2). 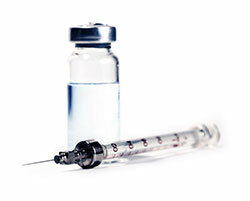 People who choose to inject HGH run the risk of receiving a poor quality or contaminated product. A recent study showed that one third of anabolic steroids on the market are countrfeit and do not contain the ingredients listed on the label in the correct dosage. It is likely that the statistics for HGH are very similar. This has the potential to cause a very dangerous situation (3). Intravenous drug delivery has many downsides, from the risk of abscess and blood poisoning from less than sterile equipment or injectables, to the devastating consequences that can emerge from sharing needles. 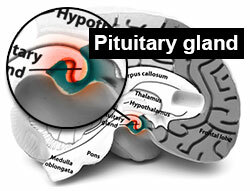 Encouraging the pituitary gland to produce more of its own HGH represents a far safer option than introducing an artificial and potentially dangerous substance into the body. Because, with supplementation, the body is still producing this hormone at normal physiological levels, albeit higher, a lot of the more severe side effects like acromegaly, carpal tunnel, and nervous system disturbances, which can occur as a result of an overload of HGH in the body, are not a concern. HGH Supplements are taken orally, and are usually a blend of amino acids Lysine and Arginine pyroglutamate, which have shown to be a potent stimulant of HGH release when taken together (4). These amino acids are found in protein in food, play many roles in the body, and are considered essential for good health. HGH Supplements also commonly contain ingredients like ZMA, a blend of essential vitamins and minerals, and natural plant extract like tribulus, both of which may safely boost testosterone production and muscle growth. HGH boosters are a class of supplement that are very safe and have very few side effects. One of the most devastating side effects for bodybuilders using HGH is carpal tunnel syndrome. This incredibly painful wrist condition can ironically stop a bodybuilder from lifting. It is caused by the increased muscle mass in the wrist placing pressure on the carpal tunnel. This is generally reversible with cessation of injections, but long term HGH abuse can cause permanent changes. Bodybuilders who inject synthetic HGH frequently do so together with anabolic steroids. The side effects of steroids are severe and negatively effect almost every organ system in the body. Concurrent HGH usage may exacerbate some of these symptoms. Although HGH is an anabolic hormone, it is not an androgen like testosterone or an anabolic steroid. While HGH users have reported increases in energy, libido and muscle mass, similar to the effects seen with testosterone, HGH will not cause androgenic side effects, like gyno, testicular shrinkage, impotence, increased body hair, acne or rage. Users of HGH supplements commonly report increases in vitality, libido and lean mass. Elemental Nutrition HGH is Mr Supplement's #1 seller, and it is one of the leading HGH supplements on the market. This is an extremely simple product, which is formulated based on a famous piece of research from Isadori et al (4), showing that equal amounts of Lysine and Arginine Pyroglutamate stimulate the natural release of HGH from the pituitary gland. Elemental's HGH also contains niacin to support the efficient metabolism of nutrients needed for growth. All ingredients in this product are safe, legal, and pharmaceutical grade. The most common side effect reported for Elemental Nutrition HGH is drowsiness. For this reason, it is best taken before bed, and can actually increase sleep quality. This is a remarkably safe product with very few side effects, which, along with its effectiveness has helped solidify its massive popularity. (1) Rudman D, Feller AG, Nagraj HS, Gergans GA, Lalitha PY, Goldberg AF, Schlenker RA, Cohn L, Rudman IW, Mattson DE. "Effects of human growth hormone in men over 60 years old". N. Engl. J. Med. 1990. 323 (1): 1–6. (2) Root AW, Root MJ. Clinical pharmacology of human growth hormone and its secretagogues. Curr Drug Targets Immune Endocr Metabol Disord. 2002 Apr;2(1):27-52. (4) Isidori A, Lo Monaco A, Cappa M. A study of growth hormone release in man after oral administration of amino acids. Curr Med Res Opin. 1981;7(7):475-81.